The medical field has seen many changes in the last couple of decades. Improvements in anesthesia, the development of minimally invasive surgical techniques and advances in diagnostic technology have spurred a growth of outpatient services. When coupled with Medicare reimbursement incentives for lower cost procedures, the shift towards outpatient services has been dramatic. 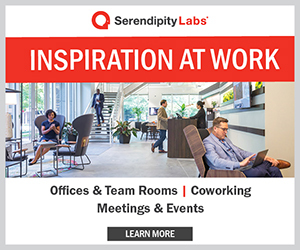 “That’s the area that has really grown in health care over the last three to five years,” says Joe Brywczynski, senior vice president and health parks administrator at WellStar. 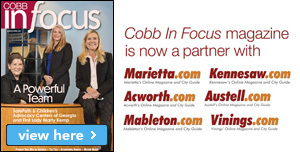 “And it’s projected to grow as much as 30 to 50 percent over the next three to five years as well.” All across Cobb County, consolidation of services has combined with outpatient services to provide more options for consumers. 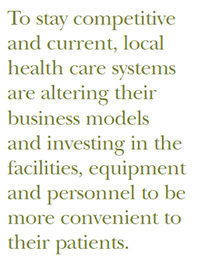 To stay competitive and current, local health care systems are altering their business models and investing in the facilities, equipment and personnel to be more convenient to their patients. Accessibility has been an important factor in the growth of outpatient services, especially in traffic-snarled metro Atlanta. 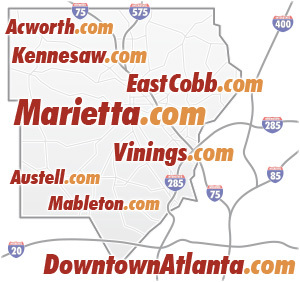 Cobb County residents are fortunate to have numerous high-quality hospitals to choose from, but they tend to be located in congested areas. 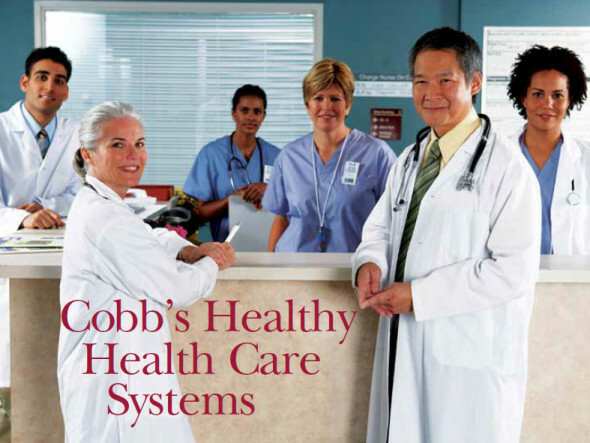 WellStar responded by developing health parks while Northside Hospital acquired stand-alone diagnostic centers and expanded services at a newly renovated medical campus in East Cobb. WellStar’s first health park opened in Acworth in July 2012. The campus includes urgent care, imaging and lab services, a pharmacy, cardiac diagnostics and other services, as well as offices for a variety of physicians. Volume has already exceeded forecasts with more than 100,000 patients served in the first year. Construction for the East Cobb health park located at Roswell and Providence roads began in April 2013 and the facility is scheduled to open in September 2014. Now competition is fierce, partly because of the reduction in Medicare reimbursements that are slashing profit margins and partly because of the increase in the number of providers. Another factor is the increase in high-deductible health plans and health savings accounts (HSAs). Since the Medicare Prescription Drug Improvement and Modernization Act passed in 2003, the number of Americans enrolled in HSAs has increased to 15.5 million, according to America’s Health Insurance Plans. These plans are becoming more popular because even though members have a high deductible, their premiums are lower and they can use their HSAs to pay for routine medical expenses. Advocates of high-deductible plans argue that when people are spending their own money for health care, they become better shoppers and are more likely to seek out lower cost services and avoid unnecessary procedures or tests. 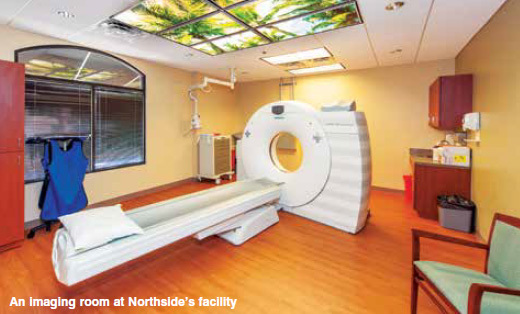 In general, independent imaging centers charge less for the same diagnostic tests as hospital-based imaging centers. Steve Wicinski, executive director of the Outpatient Imaging Coalition (gooutpatient.com), is actively trying to educate patients, employers and insurers to let them know that they do have an option when it comes to imaging. “We take all major insurers. We’re in the network and we’re cheaper. The difference can be in the thousands,” he says. Brown believes that there will be an increase in patients seeking imaging. “There’s roughly 900,000 uninsured people in Georgia according to Kaiser Permanente. We assume those people don’t go to the doctor very much. We think that when those people get coverage, they might go see a doctor and deal with that hurt knee or hurt elbow that they’ve just been living with for years,” he says.